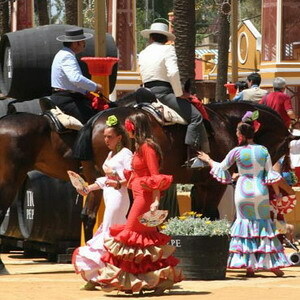 Jerez de la Frontera (prononced hereth,) is the Andalusian town from which the name Sherry is derived. Along with two other nearby towns, El Puerto de Santa Maria and Sanlucar de Barrameda, it is the only place in the world where sherry is produced. There is not a great deal of difference between the wines of Jerez and those of El Puerto, although the latter town does tend to be particularly noted for its' amontillados and finos. Sanlucar on the other hand produces an entirely different wine as all the manzanilla, with its' distinctive, fresh flavour, is produced here. So if you are holidaying in Andalucia then a trip to Jerez will certainly add much to your trip, particularly if you are there in May or Sept./Oct.